The sun was out when I got up, but it was still cold and wet. Fortunately I still had some firewood and got the fire going right away. Pretty soon the sun was strong enough I was able to get everything dry. It was probably close to 10 before I got started, but I knew it would be easy riding today. I was back on pavement now. 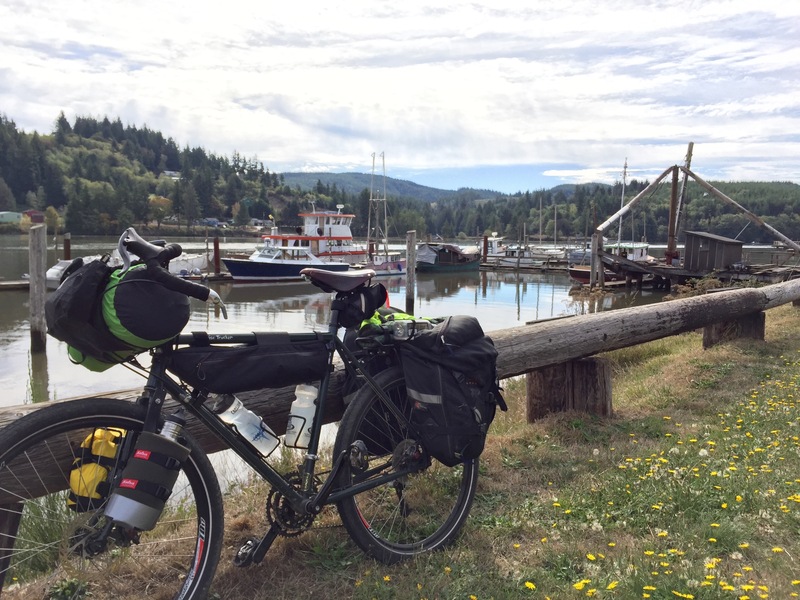 From Elk City it is 9 miles to Toledo along the Yaquina River. Very pleasant ride with hardly any cars. I wish there was a way to bypass Toledo. Besides the smelly pulp mill there is a big hill going into town, and a big hill leaving town. I got a bottle of ice tea for later and continued on. Yaquina Bay drive was probably the highlight of today's ride. It is also a popular day route for Newport locals and I saw a number of other cyclists. It is a kind of a place out of time with a few small marinas and oyster shacks. I stopped at a grassy spot by one marina for second breakfast. I do not eat a lot when touring. I can eat frequent small meals consisting of some dried fruit and almonds, or a cliff bar, but not much more. For late lunch I might have some peanut butter on a tortilla. If I eat much more it really slows me down. It was a lovely day on the coast. A few scattered clouds but mostly sunny and still cool. I found the Oceana food co-op in Newport and stopped for a cup of maté. That, and the hill I had to climb to get up from the bay front warmed be up nicely and I was able to shed all but my shorts and jersey. 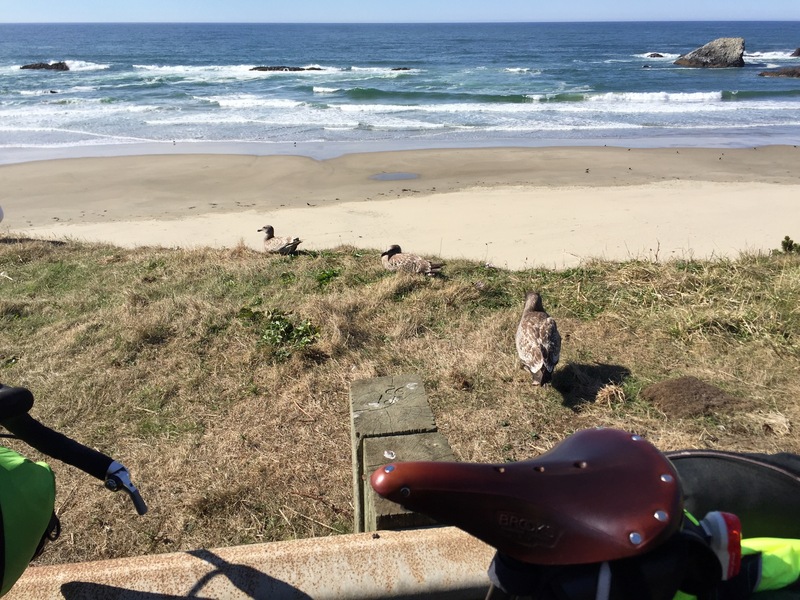 I took the posted "Oregon Coast Bike Route" through Nye beach and around the Yaquina state park, and crossed the bay bridge heading south on 101. Always a shock to get out on a busy road, especially after a day of gravel roads in the woods where I saw 2 or 3 cars all day. This stretch of 101 has an adequate shoulder and I've ridden it several times before. I ignored the south beach fish market where I usually stop for fish and chips. Not this trip. Seal Rock seems to be the sunniest and warmest stretch of beach between Newport and Waldport. Maybe the rocks block the north wind, which was providing a nice tailwind. I stopped and took some pictures while chatting with the seagulls. A bit further down I pulled into another park. It was the warmest part of the day now and I wanted to dry and air out my sleeping bag which was a bit damp from the night before. A good time for lunch as well. When I got to Waldport the read out on a bank said it was 72 degrees! Not bad for late September. Beachside state park is 4 miles south of Waldport. 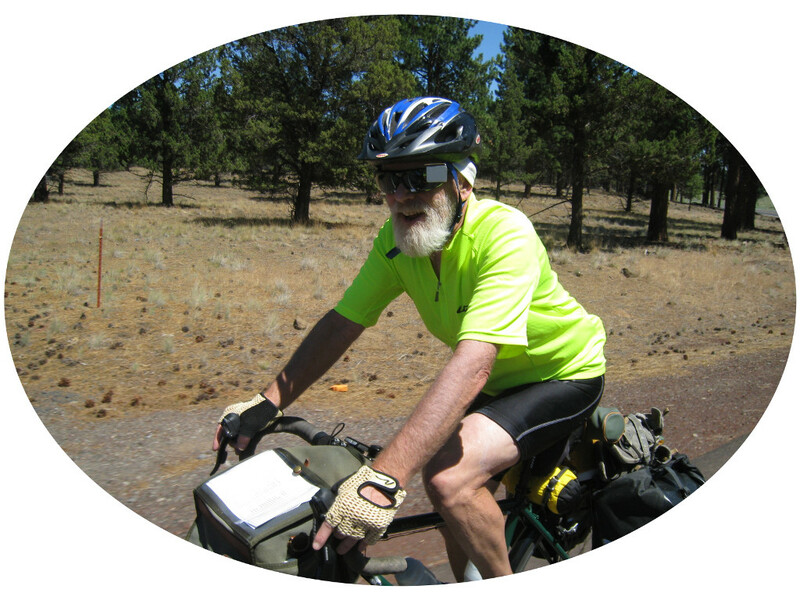 There were no other cyclists in the $6 hiker/biker camp when I got there. The camp has just 3 spots nestled in the shore pine with picnic tables, one spot being a double. I took the spot I had used before which had some filtered sun coming in. The beach is right there, but you cant get through the tangle of shore pine to get to it. You have to take a trail a short distance. The beach is quite wide and the tide was very low. I'm assuming the tides were extra low and high due to the super moon. Maybe. I laid down in a sheltered spot and took a nap in the sand. Back at camp I was preparing dinner when some other cyclists showed up. Hannah, Kate, and Benjamin were from Vancouver B.C., and Jamie was from Australia. They were all headed south, Jamie possibly to Mexico. They got settled in in time to all go down to the beach to watch the sunset. It was quite nice and really lasted a long time. There was no dew under the shore pine and everything stayed dry. I slept quite well this night.